After World War II many people of Greek Cypriot origin settled here in Australia due to political instability in their own country. Australia’s Greek Cypriot population increased dramatically in the Forties and Fifties and there was another sharp increase in the Seventies after the Turkish invasion of Cyprus. Many of these Greek Cypriot migrants settled in Victoria and more specifically Melbourne and of course they brought their food with them. 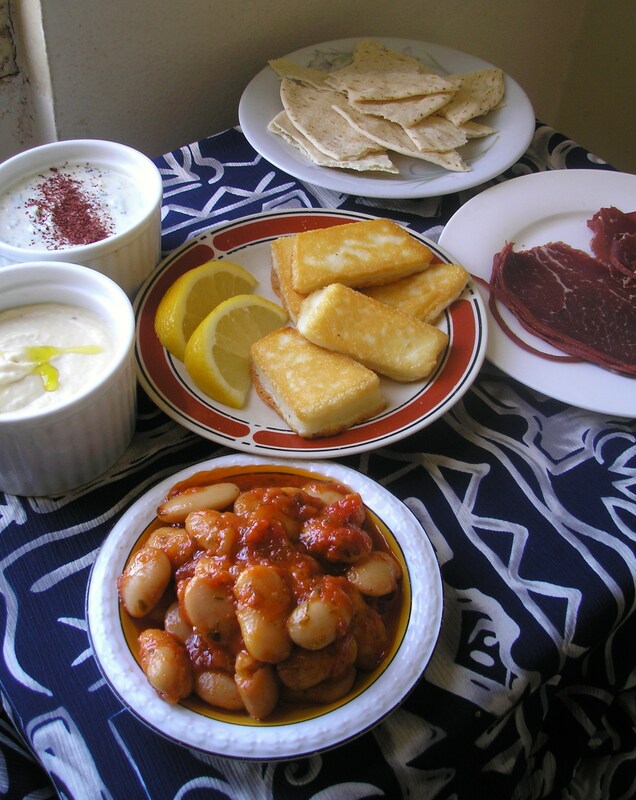 Here’s a Greek Cypriot recipe that I found in George Calombaris’ Greek Cookery from the Hellenic Heart cookbook. 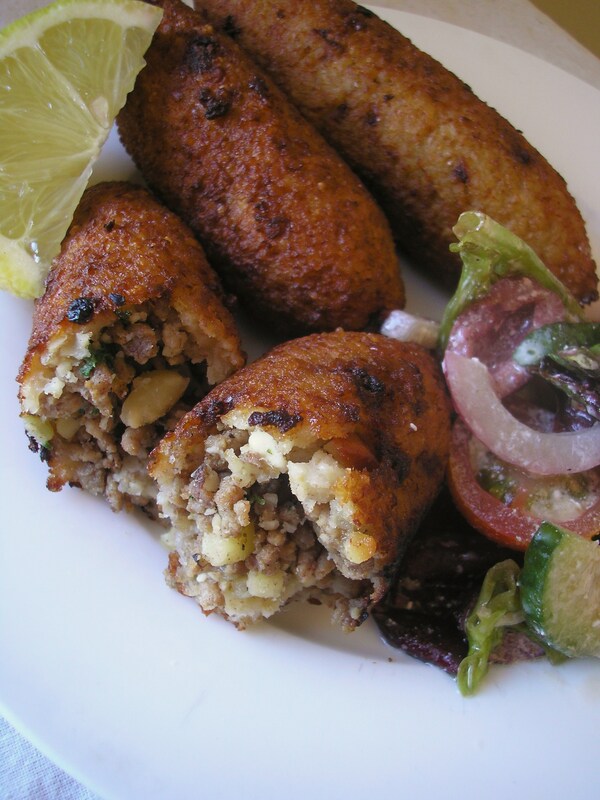 In it he uses his mother’s recipe for koupes or Cypriot pies – a tasty burghul and lamb parcel a bit like the Lebanese or Turkish kibbeh. Put burghul in a bowl, add boiling water and salt. Stir well, cover and leave for 2 hours. In a hot pan, add olive oil and mince meat. Brown meat until all liquid has evaporated, then add onion and continue to sweat. Add cinnamon powder, toasted almonds, parsley, salt and pepper to taste. Cool mix down and reserve. Add flour to burghul, knead well to form a coarse textured dough, rest for 2 hours. Take a 50g piece of burghul dough, moisten your hands with olive oil or water. Place dough in hands and flatten to make an oval shape. Place 1 tbs of meat mixture on dough and fold sides together to form a small oval shaped ball. Fry in vegetable oil at 180C until golden brown. Serve hot with lemon and salt. Koupes are good served with skordalia or tzatziki to dip. I was a mere kid when I first read Charmian Clift’s Mermaid Singing. I blame that book for many hours wasted daydreaming about life on a Greek island – eating, writing and dancing to the haunting strains of bouzouki music. Later, when I read Peel Me a Lotus, a loosely autobiographical novel about the time that Clift and husband George Johnston – famous author of My Brother Jack – spent on the Greek island of Hydra, my fantasies continued. It wasn’t until I read some of the biographical writings about Charmian Clift’s life (and had small children of my own) that I realised the time Clift and Johnston spent in Greece was not always idyllic. Johnston was apparently quite a considerate man for the time but most of the housework and childcare would still have fallen to Clift. The combination of being in a foreign country, primitive facilities, the care of small children and her frustration at not having enough time for her own writing, meant that Clift was often far from happy with her life in Greece. Besides, by the time I was reading Clift’s books the Greek islands that she and Johnston enjoyed in the Fifties had all but disappeared under a swarm of British tourists. Luckily for me, there was still Greek food to enjoy. Melbourne is home to the largest Greek population outside Greece itself so it is not hard to find your nearest Greek enclave – mine was in Oakleigh. There was a distinct smell of souvlakia in the air as I turned into the mall off Atherton Road so I knew I was on the right track. After poking around in a couple of small Greek delis I found just what I wanted at the Oakleigh Gourmet Deli in the Centro shopping centre. Here I got some kefalograviera cheese to fry for saganaki, some gigantes or giant beans and some pastourma – a type of spiced, cured beef. With these ingredients the obvious choice for lunch was mezedes. These are a series of small meze plates served in the same manner as Spanish tapas and enjoyed with the Greek drink of choice – retsina or ouzo. 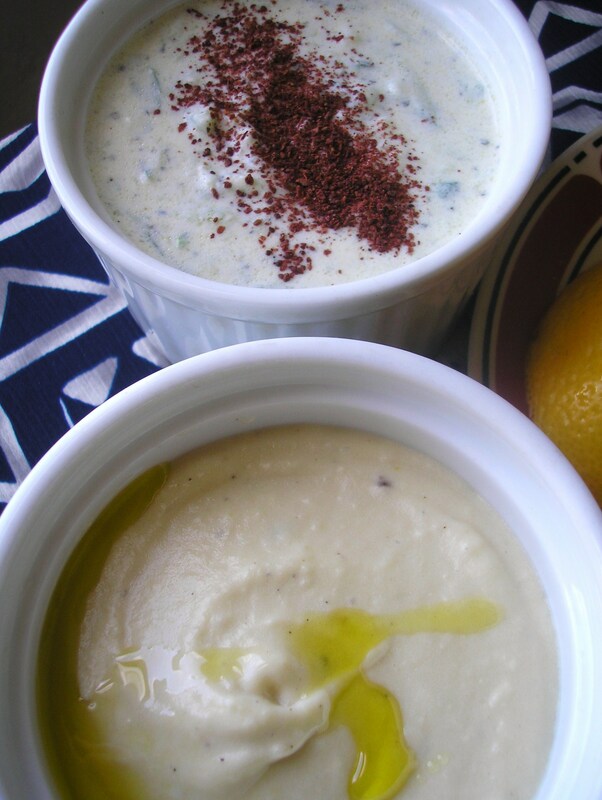 I also made a couple of dips and picked up some pita bread. Place the potatoes in a saucepan, cover with cold water and bring to the boil. Simmer for 10 mins or until tender. Drain and place in a bowl with the garlic. Beat with an electric mixer or stab blender until smooth. Whisk the oil, vinegar, lemon juice, egg yolk and 1/4 tsp sea salt together in another bowl. With the mixer on, gradually add the oil mixture to the potato (a bit like making a mayonnaise). Store the finished dip in the fridge covered with cling wrap – it benefits from sitting. When ready to serve taste for seasoning and garnish with extra virgin olive oil. Grate cucumbers and squeeze over a sieve to remove as much moisture as possible. Place yoghurt, cucumber and all other ingredients in a bowl. Mix well. Cover and place in the refrigerator for a couple of hours. Serve with pita bread. I find the best time for long slow cooking is Sunday afternoon. You have Saturday to get your ingredients together and to do any pre-preparation that may be required i.e. marinating, soaking pulses etc. In the case of my Mexican chilli beans you must soak the dried red kidney beans, or black turtle beans, for at least twenty-four hours before use. People think that this is too complicated but it really is just a matter of pouring the beans into a large bowl, covering them with cold water and leaving them on the bench overnight. When I make these beans I do a large amount and freeze some in meal sized containers for later use. These beans can be eaten in a number of ways. 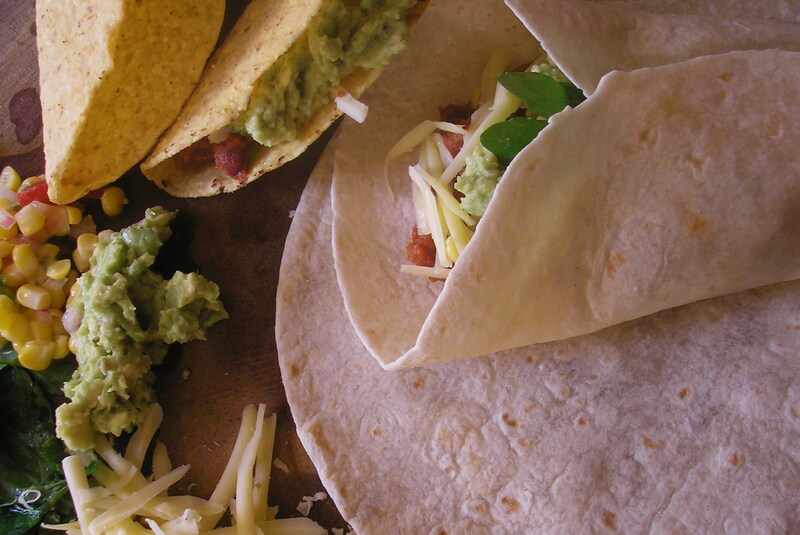 They can be served simply warmed up with rice and sour cream or they can be roughly mashed with a handful of grated cheese melted through and used as a filling for burritos, tacos or quesadillas. You can brown some meat and add one or two containers to make a meat and bean chilli or you could warm them in a pan with an egg or two cooked on top for the tasty breakfast dish huevos rancheros. If you want to turn up the heat you can add some fresh chilli when re-heating. Drain and rinse the soaked beans. Place them in a large pot, cover with cold water and bring to the boil. Reduce heat and simmer covered for 4o-45 mins. or until tender. Drain and set aside. Measure all spices and cocoa into a bowl, set aside. Heat a little oil in a large pot, gently fry the onions, jalapeno chillies and garlic. Add the spices and cook gently for 1 min. Add the tomatoes, water and beans. Bring to the boil then reduce to a simmer and cook uncovered for 2 hours stirring regularly to make sure nothing is catching on the bottom. Serve in any way you prefer. This recipe makes a large quantity so I would advise freezing at least half of it or making it when you are having a lot of people over!